I’ll give up my bike again, only when I lose both my legs NEVER. What in the world was I thinking to go without a bicycle for 4 years? Sure I was dirt poor during that time – but, no matter – the bike should have always been priority number one. After riding passionately for 17 years recently I stopped for four long years. Bicycling is the ultimate sport and way of life. Many people feel that way, not just me. My own cycling frenzy began when, in Hawaii at Hickam Air Force Base in 1985 I rode a friend’s bike, a Fuji 10 speed or 12 speed, can’t remember which. It was the first real bicycle I’ve ever ridden in my life. Sure I had the Raleigh motocross beater for $129 in 1978 which was an amazing bike of it’s own, but this was an amazingly FAST bike. This Fuji was like greased lightening. I couldn’t believe I was going so fast on a bike. When I got on it I didn’t want to get off. I told my roommate I just wanted to give it a go and that I’d be back in 10 minutes. I returned an hour and 20 minutes later, exhausted and in a state of mind that I hadn’t known before after riding almost 20 miles around base on that shiny silver Fuji. Mentally I was hooked from that point on, but didn’t purchase a bike until I moved to New York City a couple years later. My first bike was a white Cannondale aluminum frame 12 speed I think it was. I became addicted to cycling in a bad way from that point on. In New York I commuted almost daily from Astoria Blvd and Steinway Street to Central Park and to my job as a color reproduction specialist at Lamont Custom Color photo lab. Not joking… I rode through the streets of New York City almost everyday. Bicycling became my passion. My outlet for stress and my key to molding my body for endurance exercise, and eventually leading me to do bike races and triathlons. 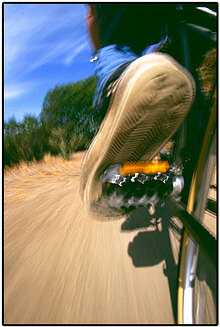 Freedom – When I’m on the bike I’m free from any responsibility and nobody can reach me on phone, email, beeper or GPS. I’m off the grid and I’m nowhere anybody would find me if they did go looking. I rarely ride the same place over and over. SuperVern – I’m a superhero on my bicycle. I feel like nothing can touch me – I’m invincible. I can beat cars, motorbikes and any other bicyclist on the road. I’m flying through reality’s 3 dimensions like I’m carving up a 30 footer at Waimea. I’m Jet Li working my way effortlessly through 16 bad guys to get where I’m going. I’m SuperVern on the bike. I don’t get the superhuman feeling while running, swimming, playing soccer or during any other activity – just cycling. Health Benefits – I’m out for an hour minimum everytime I cycle. In one hour I’m burning a minimum of 500 calories. I don’t crawl around when I go out – I’m going 15 mph minimum all the time, even up small grades. I hate to slow down. If I’m only going out for one hour I’ll probably burn 700 or more calories because that’s a short ride. If I go out for 3 hours I’m burning 500 calories an hour – 1,500 calories and that’s going relatively slow. All Vern Can Eat – If I’m cycling just 3 times per week for an average of 6 hours total then that means I burnt over 3,000 calories that I wouldn’t have if I didn’t exercise. That means I can eat pizza, spaghetti, Ice-cream or whatever I want to eat without fear of gaining weight. Bicycling is a free meal ticket to eat whatever you choose. If you over-do it with Pizza 3-days in a row, like I’ve been known to do – just add another couple hours on the bike that week and you’re right as rain. Kind to the Mind – Bicycling long distance at an easy pace is like meditation for me. I am usually thinking of nothing at all, just watching the road in front of me, maybe my wheel spinning. Sometimes I focus on making each rotation of the pedals perfectly efficient and circular. Often times I focus on my breathing. I think this may have something to do with my easy time of advancing through meditative states. I was quite used to watching my breath. I was quite used to being aware of my body and all that was going on with it. I think the coolest thing about bicycling for the masses is that it’s such a low intensity workout almost anyone can ride for 2 hours easy. Even if you’re riding easy you’re likely burning 300 calories per hour. About same as walking, except you’re seeing and experiencing a different world on the bike. Once you build up your stamina you can be doing 4 hours on a bike pedaling easily. That’s 1,200 calories gone in one day! If you get serious about it – or really want to have fun with it and challenge yourself you’ll be doing 2-3 hours at a good effort and burn 1,200-2,000 calories. Cycling is, to me – the greatest activity for my health, freedom, and mental well-being. It’s something that I’ll never again be without. I’ve made that promise to myself today. Cycling is THE ULTIMATE form of exercise because it’s just such a blast, on top of all the other benefits. Are you a superhero when you’re running on the treadmill? Are you a superhero when you’re doing bench press? Nah. Cycling is IT. Cycling is GREAT. Cycling is LIFE. Cycling is unmistakably the most fun you could have today. I was just curious about New York City. How was your life when you lived there? It seems so opposite of how you live today. Would you suggest someone living there today? New York was a good experience – just for the experience. Daily it was bizarre. I photographed homeless and celebrities daily. I pissed a LOT of people off without trying so much – just taking photos. I learned a lot about photography and people. I walked around 8-15 hours/day looking for photos. A good experience really. I could never go back. Don’t even want to visit. It’s a cesspool of humanity. lol. I just don’t like what it has to offer. It was very hard going from Oahu to NYC. I’ve not been back to live anywhere cold since. I have a serious aversion to cold. Thailand is even too cold a lot of times! I’d suggest to anyone that is thinking about moving there to go have a look first. Stay a weekend and see what happens. Maybe it’s “you”. For many people it’s exciting. Might be good to live there a year and it will affect the rest of your life. No doubt. Thank you for the information. I didn’t mean to ask about something that didn’t pertain to the post, but I was very curious and I didn’t know where else to ask. I understand the aversion to cold. At the moment most days start at 30 degrees when I go to school and end at a high of 50. I crave any heat right now, the trouble is I get too hot if it is over 85. Heh, I guess I just have to suffer some months.